What videotape formats do you accept? DDVF can process VHS, VHS-C, S-VHS, 8, Hi-8, Digital 8, Mini DV, DVCAM, Micro MV, HDV, Beta, 3/4 inch (Umatic), Betacam, and M2 formats. Click here for more information. Can you transfer old movie film (8mm, Super 8, 16mm) onto DVD or VHS? Yes! Our in-house film room can convert 8mm, Super 8 (silent or sound) and 16mm (silent or sound) directly to DVD. We can then make VHS copies if desired. Click here for more information. Will you process copyrighted materials? Videotapes of copy written materials may not be submitted for conversion without the permission of the copyright owner. If you have any questions about the ownership of the material on your videotape, please ask us first. Will you process illegal or obscene materials? We will not knowingly process any videotape that contains illegal or obscene content. If we discover such material, DDVF reserves the right to refuse service for that particular order. Since all work is done in-house, the turnaround time depends on our current workload for the type of service you are having done. You will be assigned a bin number and pickup date when you drop off your order. How much video can you process onto a DVD? Up to two hours of high quality video can be put onto a DVD (compressed in MPEG-2 format). It is possible to fit six (or more) hours of video onto the DVD, but the video quality is substantially lower. We suggest dividing larger segments into two hour increments. Transferring your videotape onto a DVD allows you to preserve precious memories. Unlike videotape, which can degrade significantly in as little as 10 years, a DVD will last hundreds of years and will look just as good each time you view it. Our transfer system inserts chapter points every 5 minutes, so it is easy to skip from scene to scene. No more fast-forwarding through hours of footage to find those memorable video moments! We process your video in MPEG-2 format to ensure high video quality in transfer and playback. However, the ultimate quality of the video depends ultimately on the quality of the original video. The better your source, the better your final DVD. Which DVD Players will work with my DDVF DVD? Your DDVF DVD will play on approximately 99% of the DVD players in distribution. Because of differing DVD formats, a few older players will not read a DDVF DVD. For a list of incompatible players, click here. Can I view the DDVF DVD on my computer? To view the DVD on your computer you will need a DVD drive and the appropriate DVD playing software. Do I get my original videotapes back? Absolutely! 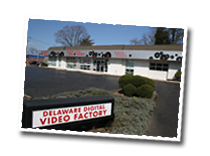 When processing is complete, your videotapes are returned to you with your completed order. I’m concerned about the privacy of my videotape. Only authorized personnel directly involved in the processing cycle will have access to the contents of your videotape. We will not distribute any reproductions, images or scenes from your video without your permission. I’m worried about losing my videotapes. We’re very sensitive about handling our customers’ videotaped memories. In order to make sure each videotape is as secure as it can be, we track each job by a unique identification number and all videotapes are kept in a secure area in our facility throughout the entire processing cycle. All work is performed on site, so your materials never leave the store. Can you handle European (PAL) video tapes? Yes! We have the ability to convert PAL to NTSC (or NTSC to PAL) and transfer the video to VHS or DVD. If you have friends or family overseas, you can send them video in the PAL standard or convert tapes you received from them to NTSC for viewing in an American VCR. Why does DDVF charge so much less then other video production companies? We have designed and created the most efficient process to encode digital video and author it directly to a DVD. This automated assembly style process allows us to produce high volumes of our products with very little man-hours involved. Can I add music to my photo slideshows? Yes, we have several royalty free selections that you can choose from. Due to copyright issues, you cannot use music from a commercial CD unless you have obtained permission from the copyright owner. Your DDVF DVD will come in a durable plastic case that is very similar to the cases used by most Hollywood studios. Yes, but editing is very time consuming and can become very expensive. After viewing your source footage we will provide a quote for our editing services based on your edit list.